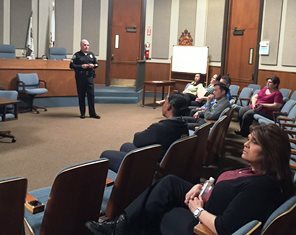 Working in conjunction with the Human Resource Office, the police department provided multiple 90-minute training programs for employees from various departments throughout the city. These presentations included an overview of previous active shooter events, lessons learned, personal preparation and response preparedness, interacting with responding law enforcement and fostering a safe workplace. Employees learned how to be emotionally, mentally and physically prepared to respond to such an event, as well as the "Run. Hide. Fight." concepts. The program was well received and provided our employees with the knowledge needed to protect themselves and others in the event of an emergency.